For less than $23 a day! Don't need a full-time desk? View our other rates here. Join a great co-working community! Founded in 2006, berrins is the original co-working space in Manly. We are located opposite Manly Fast Ferry, and right next to the best coffee in town. Manly's best coffee right next door! In the heart of Manly. Berrins co-working space is conveniently located across the road from Manly Fast Ferry, where you can be transported into the heart of Sydney’s CBD within 20 minutes. Perfect for offsite client meetings or appointments. Our beautiful Fireside Meeting Room is a popular place to meet among Manly business locals. Comfortably seating up to 8, with double height ceilings, loads of natural light, and high quality fit-out – it’s THE place to meet your clients. The Cosy Corner is a private space for our residents to make calls or have video conferences. Fitted out with a cube chair, side table and whiteboard – it’s the perfect break out area when you need it most! 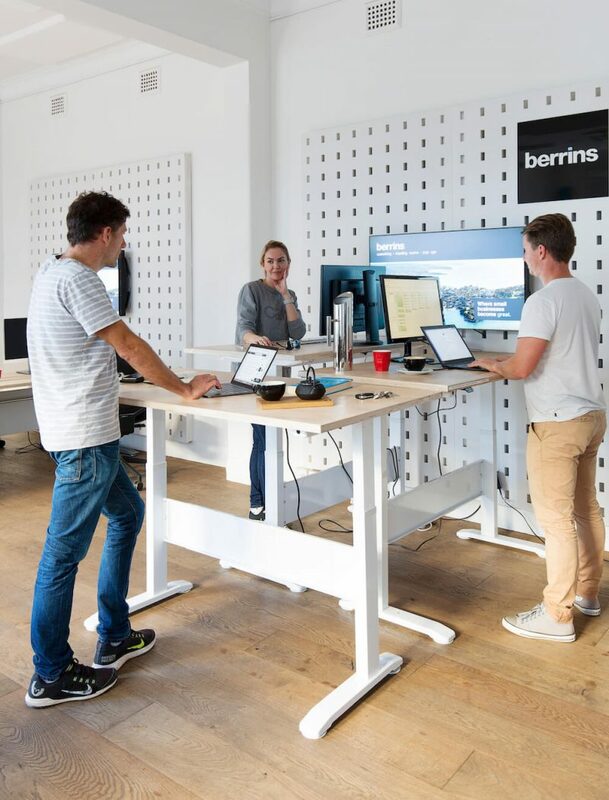 Join the berrins co-working crew! Our co-working space is the place where small business becomes great! Our residents include some of the Northern Beaches’ smartest business owners and creatives. I have been working at Berrins for just over a year and have loved every minute of it! The office is really modern and is in a great location next to a coffee shop and the beach. Berrins is an awesome coworking space… I recommend! A relaxed yet inspiring working space that manages to tick all the boxes. Next to the best coffee in Manly, 1 minute walk to the ferry, and has a touch of humour. Nice office space with harbour views and heaps of natural light. A great place to hold meetings with clients as the overall look and feel of the place is very professional, clean, design. It’s a great location as it’s across the street from the Manly wharf often have to jump on the ferry to meet clients. I don't need 5 days a week. Do you have other payment packages?I don't need 5 days a week. Do you have other packages available? Yes! We have packages available based on 1, 2, 3 and 4 days a week! Simply contact us for a chat. We operate on a month by month payment cycle. Payments are taking one month in advance and if you decide to leave, we require one months’ notice. The cost of your membership includes a dedicated desk, free high speed Wifi, a chair, mail and package handling, and access to the space around the clock. You also receive 50% off all meeting room bookings. We hold your credit card securely on file and charge it monthly, at the beginning of the month, using Stripe payment gateway. Who else works at berrins? We have a co-working community that include a website developer, digital marketer, photographer, videographer, fintech founder, and a couple of other entrepreneurs! At this time we’re only accepting applications from two legged friends. Sorry! You are more than welcome to cycle to work, however we don’t have any bike storage on site. There is a large bike storage facility just across the road at the Manly commuter bike rack that we recommend you use. With our friendly Office Manager, Mel!